The magic that is a Disney movie is truly evident in any number of the classic animated features in their catalog. Included in this list is Sleeping Beauty, which has a Diamond edition release Blu-ray, Digital HD, and DVD combo pack. For anyone, young or old, who previously has not purchased a copy of this film, the diamond edition is a terrific addition to your Disney princess movie collection. Parents and grandparents everywhere should add this to their list of holiday presents for doe-eyed little girls and friends of new parents would be amiss not to include this in a collection of gifts for a precious newborn. Sleeping Beauty tells the story of Princess Aurora, cursed as an infant by the scornful Faerie, Maleficent, to prick her finger and die on her 16th birthday. Saved from certain death, Faerie Merryweather instead alters the curse to have Aurora enter a deep slumber only to be woken by love's true kiss. Unconvinced by the alteration of the spell, The king and queen send Aurora to live in deep in the woods under an assumed name and the watchful eye of the three good faeries, Flora, Fauna and Merryweather. Unfortunately, just as foretold, Maleficent tricks Aurora and she falls into a deep slumber anyway. Ultimately she is saved by "love's true kiss" in the form of handsome Prince Phillip who, ironically, she was betrothed to upon her birth. It's convenient that they happen to fall in love since they will be getting married anyway. While true to many of the "happily ever after" plots we've come to know and love from Disney, this film is actually only 75 minutes long and even then, many of the scenes feel like "filler". It also was one of the last fairy adaptations for almost 30 years until The Little Mermaid came along and resurrected the genre. Despite that, Sleeping beauty has weathered the test of time very well and with the latest technologies has found new life in Blu-ray release. 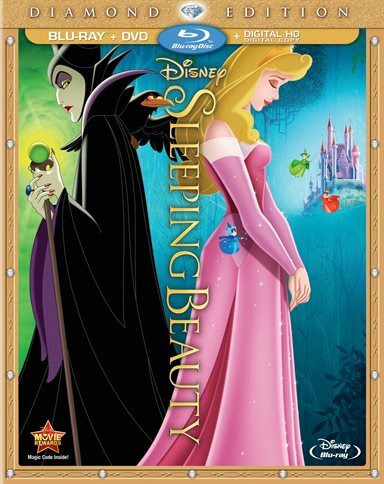 Even though it was a flop when it was originally released, the technologically advanced for its time, Sleeping Beauty offers magnificent and vibrant colors that are only enhanced by the 1080p high definition video. The 7.1 DTS-HDMA audio highlights the orchestration of a beautiful and haunting soundtrack. However, this was the same technology that was available for the 2008 50th anniversary Platinum Edition so if you own that copy of that version you may not feel the need to buy another one. Also many of the extra features in this set were also included in the previous release 6 years ago. The new features include a segment called "The art of Evil: Generations of Disney Villains" in which animators Lino DiSalvo (Frozen) and Andreas Deja (Aladdin, The Lion King) share their thoughts of their favorite Disney villains and discuss the keys to creating memorable characters. Another segment called "Disney Animation: Artists in Motion" showcases the artistry of Brittney Lee (Wreck-It Ralph, Frozen,), as she intricately creates a paper model of Maleficent. There is also "Beauty-Oke: Once Upon A Dream", a fun sing-along and three deleted scenes that were never completed. For more information about Sleeping Beauty visit the FlickDirect Movie Database.